The widespread issue of website owners neglecting the value of their web content is a big problem. We should talk about this problem because, if you think about it, when people go online their primary reason for doing so is to consume content. To read blog posts, to look at status updates of our friends on Facebook, to read reviews about a restaurant we are thinking of going to, to look at our credit card spending habits through our bank’s website, to learn about something that interests us — these are just some of the common activities we do on the Web. And these activities are all centered around the consumption of content. There are some companies that are starting to progressively rethink their strategies regarding web content. This needs to happen more often. Allow me to go over the importance of a solid content strategy, as well as some starting points for developing your own web content strategy. The focus and widespread knowledge towards the importance of web design, web development, usability, and user experience is definitely positive, considering that only a few years ago most of the meetings I have had with clients had to start with an explanation of what the term “usability” meant. However, what is missing in these discussions — what is in desperate need of attention — is web content and the creation of a comprehensive and unified strategy for it. A discussion about web content during planning is often limited to who will be in charge of it. In the best of cases, sometimes there will be discussions about SEO or social media marketing of content. Most of the time, that’s it. And that’s not close to being enough. In addition to the commonplace disregard of web content in most websites, another big challenge is the coordination and proper design of the content creation process. In large websites, for example, each website section/department/subdomain might have a different editor working without consulting other team members. Then, the legal department might also put their two cents in and require the modification of content out of the context of the main objectives, and without considering the entire collection of the site’s content. Then, after all is said and done, the CEO/client/decision-makers — all of whom always know best — might ask for revisions. And voila! Instead of a consistent message across the entire site, we have a mishmash of content. It’s impossible to develop a consistent tone of voice with a content-production workflow like that. Our web content strategy must be unified, and our content should work together in unison to make a better overall user experience. Losses that stem from a deficient web content strategy are easy to imagine. In general, Web users are more discerning and choosy than ever before about the content they choose to consume. A poor user experience with your content will have very little chance of being read by your target audience. And, let us talk in terms of online marketing and sales: None of your marketing messages will be able to sell a product without being useful and without being well-crafted. If the content across the funnel is a mess, forget about conversion. Hard-to-read product descriptions, bad photos, vague purchasing/check-out processes with clumsily written and confusing web copy and UI labels — errors like these will cost your website a lot of lost revenue. More and more companies are realizing the facts related to the importance of web content and the need for a solid content strategy framework. One of the best ways to start a discussion about web content strategy is by looking at successful cases. Looking for case studies on web content strategy, I was able to discover efforts taken by some really big brands and organizations. Here are three of them. A great illustration of a well-thought-out web content strategy is the recently announced communication strategy from one of the giants of the business world. Coca-Cola Content 2020 is a far-reaching plan organized completely around content and its flow between the Coca-Cola brand and its consumers. The fact that such a big player makes up all of the marketing around content is an admirable thing to look at. The YouTube video discussing Content 2020 is, in itself, proof of the Coca-Cola content strategy’s efficacy: The video attracts attention with its originality, being full of informative details and candidly presenting the change that the concept will introduce. The result? 300,000+ YouTube views and many enthusiastic comments. National Public Radio (NPR) has developed an inspiring strategy called Create Once, Publish Everywhere. The concept is simple: Produce content that will be available in all forms of media. A leading example of a company associated with good content strategy is Red Bull. 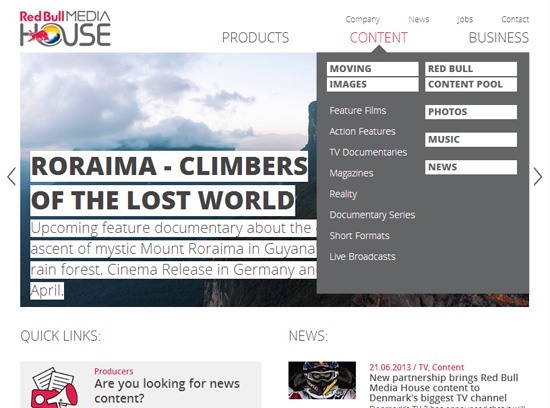 Red Bull, an energy drink company, even has its own media house! That is a testament to the brand’s dedication to content. We can observe Red Bull transitioning from the typical sponsored posts, sponsored reviews, and press releases, to producing their own interesting and enriching online content. Looking at these examples, we can see a couple of patterns emerging. Good content is not accidental. Good content is a result of a good content strategy; a strategy that puts the emphasis on producing valuable, useful, and interesting content. You should decide right at the start that the primary objective of your content strategy is to meet the needs of users, not the thoughtless promotion of your brand. Content strategy must be fully integrated with the company’s other processes; it should not be an afterthought. Good content requires patience and consistency. Instead of aiming for a spectacular one-time-big-time viral success, it’s necessary to build a solid foundation and plan for the long haul. It can take months, even years, to develop an effective content strategy. I will discuss some key parts of this workflow in just a little bit. The essential concept behind a good content strategy is that each component of it should benefit the user. If a certain piece of content does not serve the user, we should remove it or revise it. The key to effective content-planning may be the 70/20/10 rule Coca-Cola formulated (shown earlier). 70% of the content should be low-risk content that we use to fulfill the basic communication objectives of the company. 20% is innovative medium-risk content that enables the brand to take a slightly different approach and to experiment with various forms of content marketing. If these new content types are successful, it becomes low-risk content over the time. 10% is high-risk content that have a significant chance of being unsuccessful, such as viral content. Let me now discuss some key stages of the content strategy development workflow. 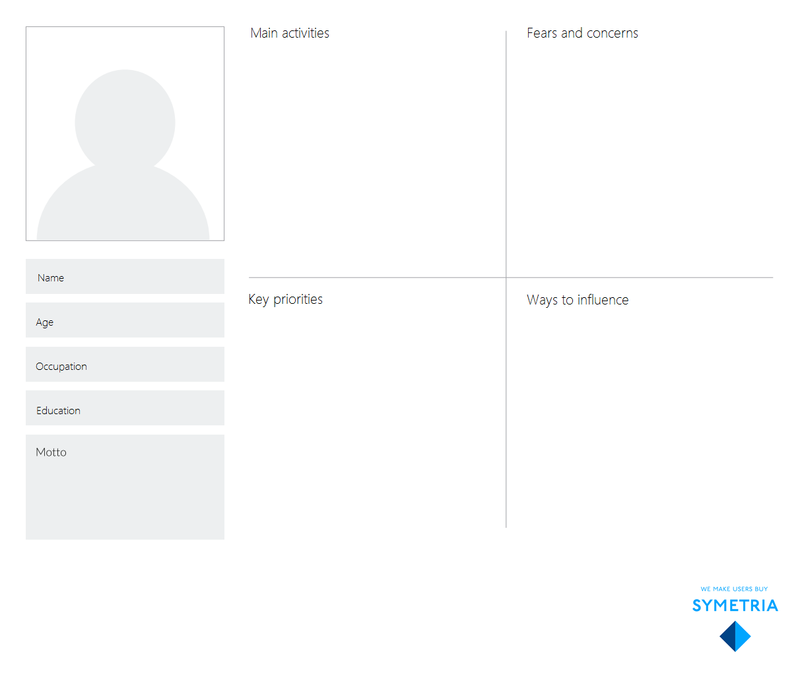 Personas are an effective way to capture the essence of the various segments of the website’s audience based on the information we derive from them. The key to content strategy success, after all, is to understand who our users are and what they expect from us. Representing target groups in the form of a person’s profile may seem simplistic, but the result will be stuck in the memory of team members and content producers. Feel free to download the full-size image here. A clear definition of our customers enables us to analyze how they might prefer to consume web content. 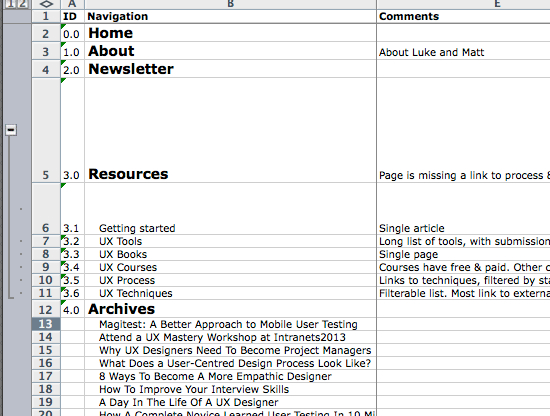 After that is done (through personas), we are ready to prepare for content production. We can conduct content auditing and gap analysis to see how our current online communication (on the website, social media, email, etc.) responds to the needs of customers. What type of content is missing in the system? Is there content that needs to be removed or revised? Are individual pieces of content being represented in the proper form (text, graphics, video, audio, etc.)? Are there any pieces of content placed in the wrong part of the customer journey? Knowledge derived from these activities will be a strong foundation to work on top of, and will describe the basic guidelines for the content production process. But this stage is only the starting point to results and deliverables. We now need to move on to production. Once we are current with the existing content and after we have identified our content’s objectives, it’s time to plot out a strategy for creating content. 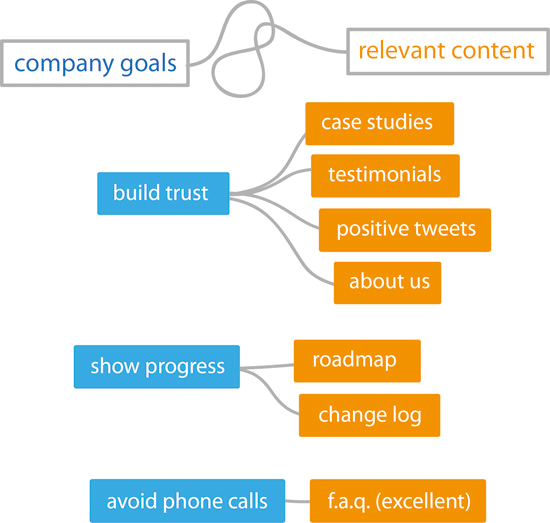 To produce harmonious web content you can use a popular technique called content mapping. What are the key messages we need to include within our website’s copy and beyond? What type of content will be used for a particular topic? What is the structure of each content type? What is the purpose of each content type? Is it to help the content consumer with an issue? Is it to educate? Is it to result in a purchase? Content mapping should be a comprehensive illustration of how a piece of content will affect the content consumer. Each piece of content should serve a specific task. This task may be to bring prospects closer to a purchasing decision. It may be to improve customer satisfaction after a purchase has been made. It could be about building a relationship between the brand and the consumer. Whatever task that is, it needs to be identified at this portion of the process. 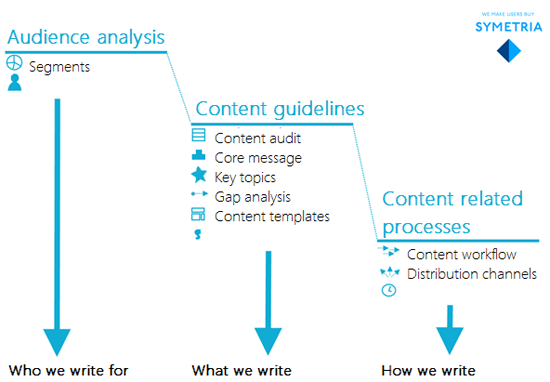 While the content map shows us the overall relations of different content types and pieces of content, the specific guidelines are defined within content templates. Content templates are created as we break down the microstructure of each content type, defining goals and rules for every chunk of content. Doing the steps above will give you a solid foundation to build on top of that will set the stage for a good content strategy. We live in an era where “experience” is a commodity. We expect every single moment we experience on the Web to entertain, develop, and enrich us. And content is a powerful experience transmitter. Content consumers are very selective of the information they receive, and expectations from content producers are high. Let us not take this fact for granted.